If you have seen the recent John Deere Tractor commercials during major sports broadcasts, you will see the man who created a world of inspiring designs by his artful trimming of shrubs. This is an update of a previous blog entry. The man is Pearl Fryar and he does the darndest things to shrubs. Mr. Fryar probably called these things bushes, shrubs or even by their given names as we, too, would prefer. Somebody from some agency, gallery or university came along and declared them to be "botanicals", the term which we are now obligated to use. Back in January of 2006 we began to hear of Mr. Fryar and his work and decided to pop up to Bishopville. We posted some of these photos and copy back then in the blog. 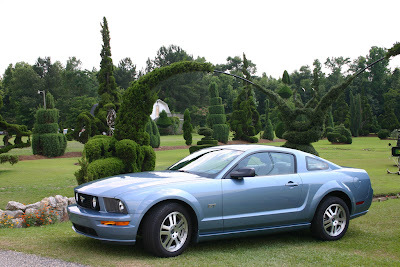 It's a long way to Topiary, It's a long way I know....well, about 165 Miles to Bishopville, the Seat of Lee County, South Carolina. The mileage from Charleston just happens to coincide with the address of a most unusual botanical artist which he has rendered in topiary-numerics in his front yard. Just try working this out with your riding lawnmower. This is NOT Photoshop, but the real living topiary plants which form these numbers. There being no Academy of Topiary Art around these parts, the artist, Mr. Pearl Fryar, is a self taught man. He began experimenting by cutting plants on his property into unusual forms in 1984. It seems to have been a lark which begat a hobby which begat a stylistic art form which is both eccentric and captivating. He branched out into larger and more daring shaping of his plants and hedges from an apparent desire to win the Yard-of-the-Month award. Mr. Fryar wasn't working via cutouts from British garden magazines nor was he following any path known to him. He didn't call this art nor himself an artist. He just went out into his yard and nipped and tucked or whacked and hacked his way with only imagination as a guide. 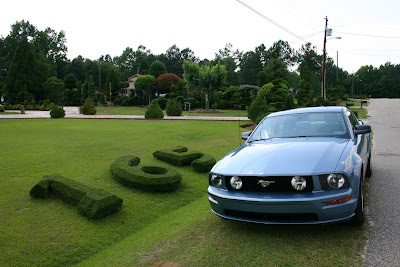 Now he has a yard full of topiary art which has spread throughout his neighborhood. .
Word of this extraordinary undertaking spread so far by early 2006 that paved parking and a turning circle for tour buses has been laid to accommodate the flow of visitors. We didn't get to meet Mr. Fryar, but hope to learn more about him from the film which is called "A Man Named Pearl".